From the legendary Mahatma Gandhi to the active figure of Bishop Desmond Tutu, religion has played a prominent role in the transformation of Southern African Societies. Their emergence from the dark era of apartheid represents a beacon of hope for nations and peoples rich and poor. South Africa’s peaceful transition from such extreme conditions to a pluralist democracy will remain a wonder to be studied and emulated. 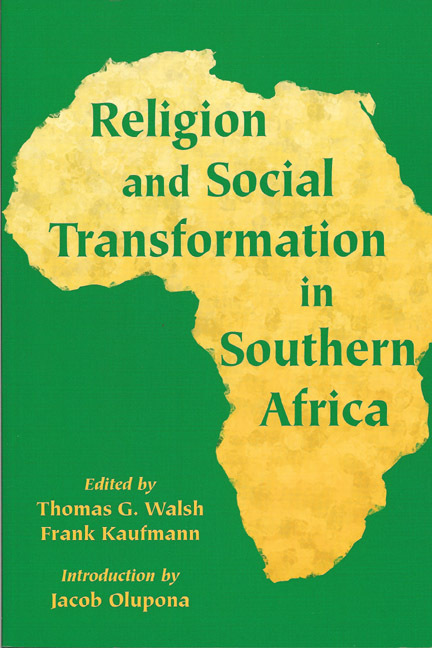 This book presents a spectrum of religious views from Southern Africa, many with a passion and level of engagement often difficult to find in scholarly approaches. The range, focus, and currency of this collection makes this book a worthy study, not just for those interested in Southern Africa or preparing to visit there, but for readers interested in how religious and spiritual insights can directly influence the shape of political, social, and cultural reality affecting daily life. THOMAS G. WALSH serves as the Executive Director of the International Religious Foundation. He is the editor of both Dialogue and Alliance, a scholarly interfaith journal, and the newsletter of the Inter-Religious Federation for World Peace. Active in international interfaith affairs, he has published numerous articles, and edited several volumes on ecumenical and interfaith topics. FRANK KAUFMANN is the Executive Director of the Inter-Religious Federation for World Peace. He serves as advisor to several interfaith and religious freedom organizations including Religion-Crisis Task Force and the International Coalition for Religious Freedom. He is the author of Foundations of Modern Church History and editor of a number of works on religion and peace.